“For too long, women have not been heard or believed if they dare speak the truth to the power of those men ... but their time is up. Their time is up! 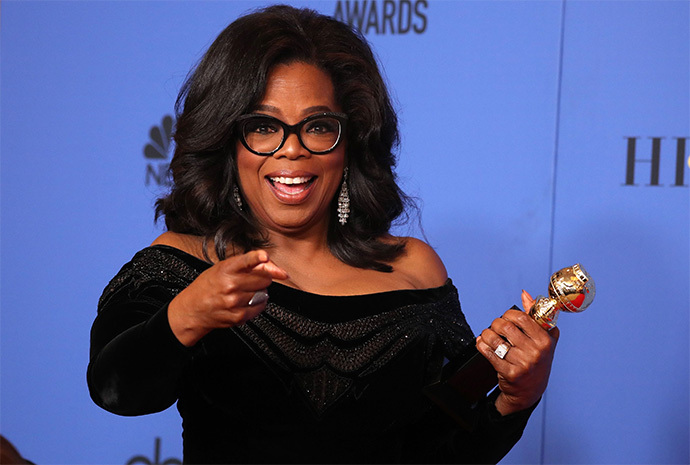 Their time is up.” This was part of the powerful speech that Oprah Winfrey delivered at the 75th Golden Globes Awards on 7th when she accepted the Cecil B. DeMille award, and it got the crowd on their feet with thunderous applause. The topics of harassment and the power of women are echoed throughout the ceremony, not just in Winfrey’s delivery. Winfrey is a successful talk show host for a good reason. She’s warm, charismatic and extremely empathetic. She brought all of her best intentions and gave a rousing speech on equality, braving the odds and always speaking the truth. “What I know for sure is that speaking your truth is the most powerful tool we all have and I’m especially proud and inspired by all the women who have felt strong enough to stand up and share their personal stories,” she said. Her speech got some of the attendees like Laura Dern all shook up. At the night’s end, there isn’t a single person not convinced that Oprah should run for Presidency. 2. Did You Forget the #WhyWeWearBlack memo? 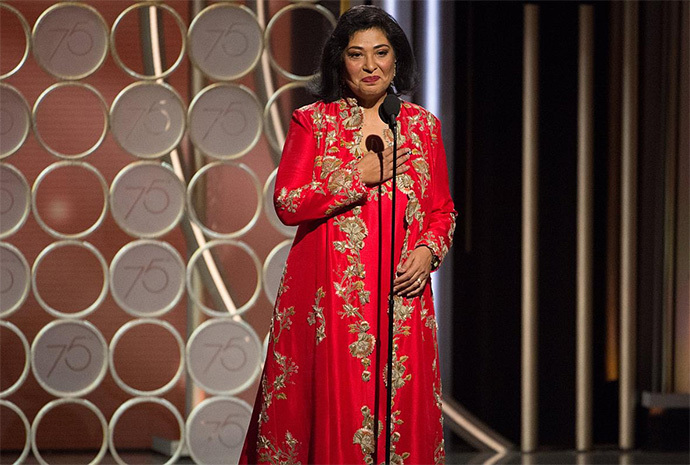 While almost everyone wore their best attire to the ceremony, the president of the Hollywood Foreign Press Association, Meher Tatna, wore a striking red ensemble instead, moving like a red-hot laser sight on a rifle amongst the all-black crowd. She clearly got the #TimesUp memo, she was wearing the pin, but she didn’t wear black for a good reason. "My mom and I planned this together a couple of months ago, it is a cultural thing," she explained (Tatna is Indian). "When you have a celebration, you don't wear black. So she would be appalled if I were to [have] worn black. And so this is, for my mom." With her attire, she is also making a statement that #TimesUp is not just blindly following the crowd, but that being true to your heart is more important. Prior to the awards, there was already plenty of buzz on the lack of diversity in the nominations, and it took a plucky Portman to say it. The actress was beaming and ready to burst into laughter like she was led in on a joke right before she came out to present. 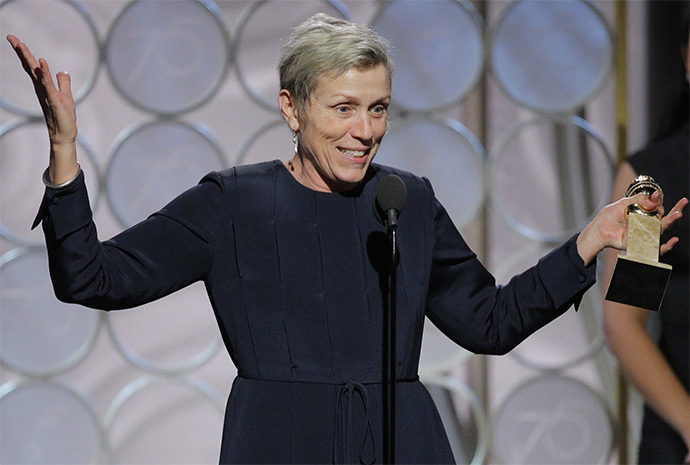 And when the time came for her lines for the Best Director category, she said it succinctly, “and here are the all-male nominees." Later when Barbra Streisand presented the award fr Best Motion Picture-Drama, she also pointed out that she was the only woman who has received the Golden Globe for Best Director, and that was 34 years ago for Yentl. 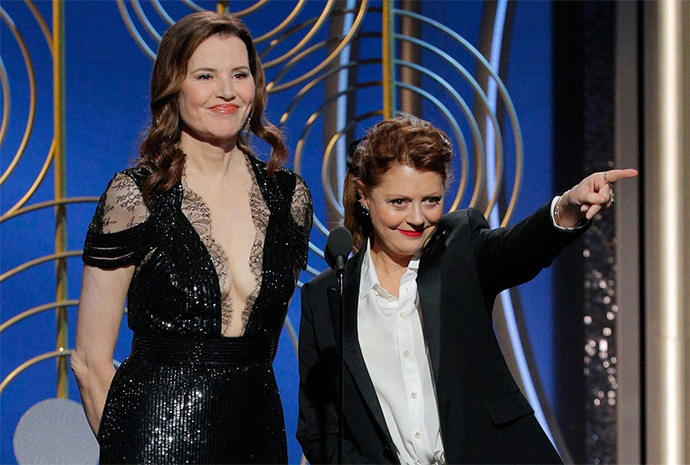 On a night that celebrated the power of women, it was a welcoming sight to see Geena Davis and Susan Sarandon presenting together. Thelma & Louise, starring the pair, was released 27 years ago, and while Sarandon is still pretty active, Davis has been largely low profile. And no, they didn’t miss the chance to make a dig at the wage inequality in Hollywood. Davis joked before presenting the award for Best Actor in a Motion Picture, "These men have agreed to give half of their salary back so the women can make more than them." Did you know the original Spartacus is over 100 years old? What a sight to see Douglas at the show. The Golden Globes paid tribute to the accomplished actor with a montage of his performances. In a wheelchair accompanied by his daughter-in-law Catherine Zeta-Jones, Douglas was largely incomprehensible when he tried to speak, but who cares, he’s a centenarian! Zeta-Jones credited Douglas by putting an end to the Hollywood blacklist in the mid-50s by hiring blacklisted writers. 8. Guillermo del Toro finally wins! We all know Guillermo del Toro is a genius, but strangely, the maestro of dark fantasy pieces had not won a major award yet. In his speech, he shared that he’d remained faithful to monsters since he was a child, creating “strange, little stories and shed an insight into his life. “These strange stories have saved my life," he said. As the music aimed at ending winners’ speech started to play, he continued, "Lower the music. It's taken 25 years. Give me a minute!" Blatantly left out of the Best Director category, the Greta Gerwig-directed Lady Bird is the little engine that could. The movie won a Best Actress award for the talented Saoirse Ronan and took home the Best Motion Picture in the Musical or Comedy category, beating movies like Get Out and The Greatest Showman. What a win, for a film written and directed by a woman, about the complicated world of women and how they connect with each other. 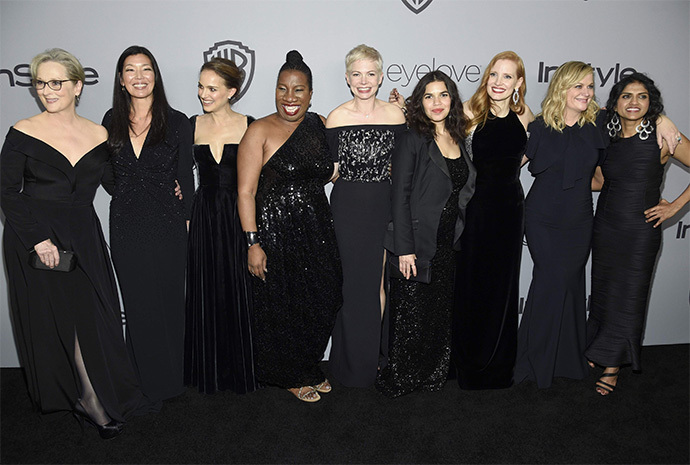 The #TImesUp Initiative proves that it’s not a self-absorbed idea dreamed up by Hollywood actresses because they can, but a legitimate programme that aims at reaching out to diverse industries. While in the years past, Golden Globe attendees tend to bring their significant others or families to the ceremonies, this year is a bit different. 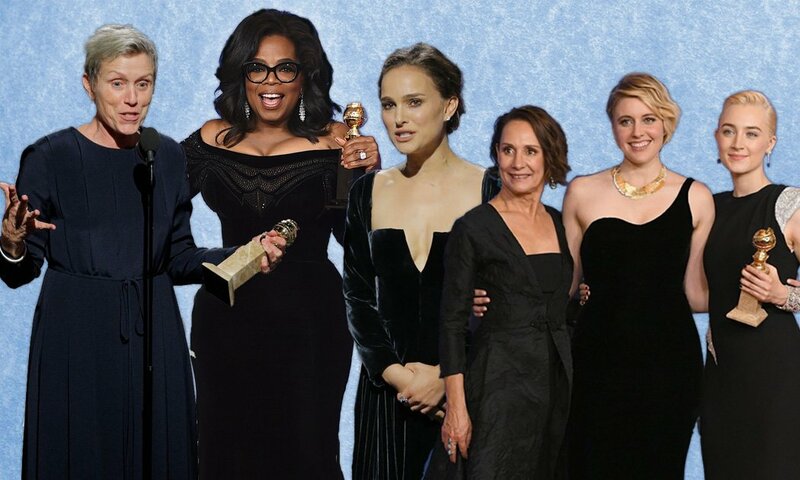 Seven activists representing different causes were invited as the plus one to the Globes. 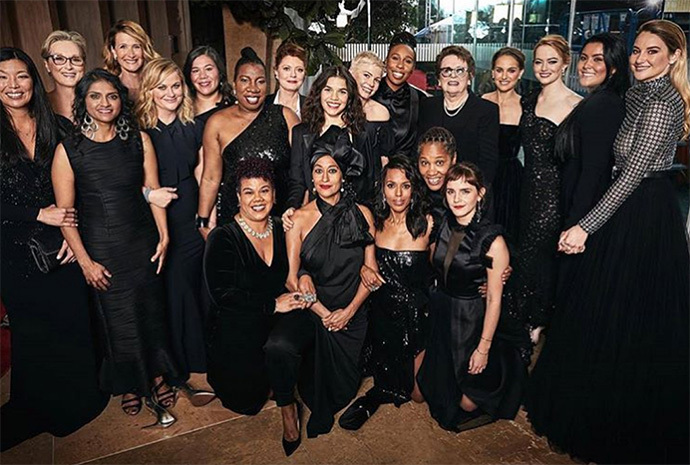 Tarana Burke, the original founder of the #MeToo campaign and director of the non-profit Girls for Gender Equity, walked the red carpet with Michelle Williams, while Ai-jen Poo, who organises female immigrant workers and is the director of the National Domestic Workers Alliance was Meryl Streep’s date. Among the group are also women who fight for ending violence against black and minority women, ending sexual violence against farm workers and more. The idea was to highlight their causes to the world and giving them a voice. Golden Globe Nominations: Who’s In, Who’s Out, and Who’s a Surprise?